It’s been one year since Ikea and British designer Tom Dixon debuted their Delaktig sofa. Whether used as a traditional sectional, simple armchair, or double daybed, the seating series offered a glimpse of a new way of modular living. Since then, we’ve been patiently waiting to see what the Swedish retailer and industrial design icon have in store next. Luckily, that day has finally arrived—and, to our surprise, their latest debut has little to do with the living room. Meet, the Delaktig bed frame. Launching in February 2019, Ikea x Tom Dixon’s hackable bedroom staple is designed to be personalized and transformed with a series of headboards and accessories. There seems to be an attachment for every mood. Feeling earthy and neutral? We love the rattan headboard for a down-to-earth look. Leaning toward a graphic and modern makeover? The jet-black headboard will double as a dramatic backdrop. Building on the growing belief that furniture should adopt and change with our increasingly busier lives, Dixon’s creations for Ikea are specifically geared toward smaller homes, multitasking families, and new technology. This adaptable bed is now one of many new Ikea products that’s designed to mold to your lifestyle—not the other way around. Not unlike the sofa, the platform for the Delaktig bed frame is made out of 50% recycled aluminum. Aside from making self-professed Ikea hackers very happy, the piece’s ultra-lightweight frame will make the moving process a little more enjoyable for renters too. 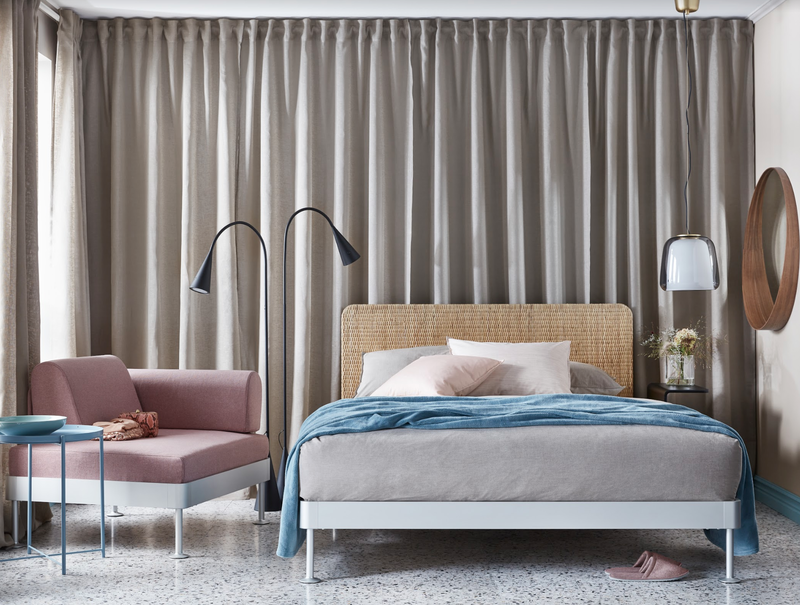 Along with the new Delaktig bed frame and headboards, the upcoming launch will also include a new wave of covers for the existing seating series, including dusty pink, soft beige, and stone gray. Now, the mini sitting room you’ve carved out in your bedroom can change to fit the vibe and style of your headboard. The Delaktig platform bed frame is available in queen size, with your choice of mattress. While the price may vary depending on the headboard you choose to accompany the frame, the piece is expected to retail for approximately $450.